I would like to share my recent experience in buying an item from Taobao. 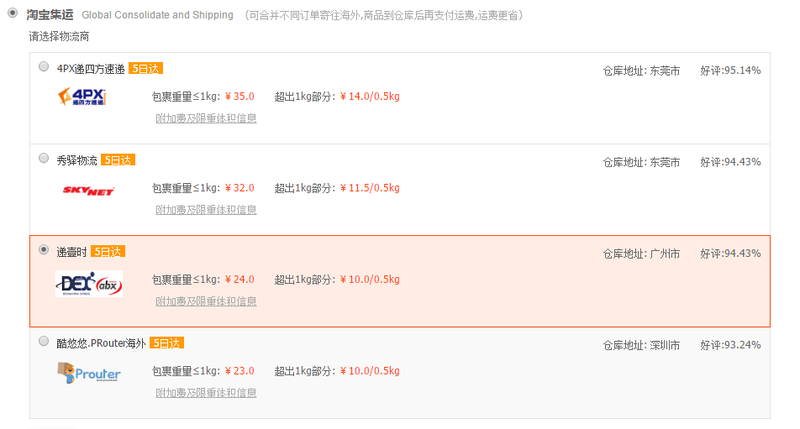 This is my first time purchasing from Taobao even though I already knew about it long time ago. It was somewhat challenging at first especially on the language. I find it hard to read Mandarin and I felt sceptical about buying from Taobao. If you are unable to read Mandarin, I would recommend either you use google translate (not necessarily correct) or get help from a friend for the first time. After that it will be easy as the steps are the same. I did get some guidance from my colleague (who is a big fan of it) for my 1st trial. It is easy but you will need to identify the trusted seller and also the delivery method to Malaysia (not all items can be delivered to Malaysia, some may cause you a big boom in transportation cost). So, I am going to share with you some tips and step by step guide how I made purchases. Firstly, you need to log in to https://world.taobao.com/. The website will track your location and display your homecountry. 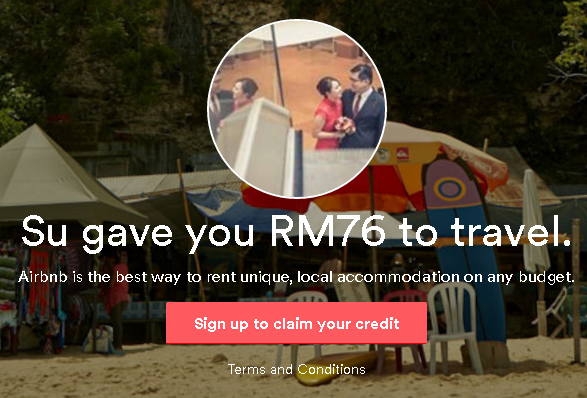 Prices will be shown in MYR, however when you make payment, it will be charge under RMB (China currency). If you are new to Taobao, I would recommend that you to sign up first for easy check out and payment. When signing up, you will need to register with your phone number and email address, after that set up your password. A verification email will be sent to your email. Once you have completed the registration, go to the home page and search for the goods that you would like to purchase. For example, I wanted a Hurom slow juicer ever since I moved into my new house. I checked online, the nearest and cheapest place I can find is Lazada but the price is still way higher so I looked at Taobao which is just half of the price. Tip 1: Filter the page using the highest transaction made before I look out for the lowest or most reasonable price. This is to avoid any dispute or fake sellers. Tip 2: Check the rating of the seller. Choose ratings with around 3 diamonds and above. The best if the seller rating is the crown symbol which mean they got the best rating in Taobao, most of the time the price is much more higher. Tip 3: Check the review from the buyers to ensure good reviews on this seller in terms of quality of product and delivery time. Sometimes, you may see a truck symbol to state that the sellers did sold products to your home country or other international countries for the past month. Once you decided to purchase, click on the orange button to add the item into your cart. Go to your cart to make payment. Tick on the item then click on the big colour button to make payment. 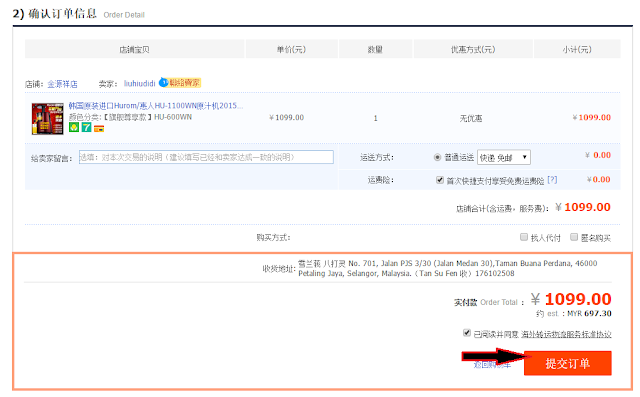 When you are at the ordering page, I would recommend to pick your shipping method for Global Consolidate and Shipping (not all sellers has this option, so check before making payment). The Global Consolidate and Shipping method is a lot cheaper than using the Direct Shipping. It means once the order is received, the seller will send the goods to the authorised warehouse for international shipping. You will need to pay the shipping fee separately to the warehouse. You may also pick on the type of courier service for local delivery. I was recommended by my colleague to pick on ABX courier service because it is slightly cheaper and faster delivery. You may choose others as well. Also note that, shipping charges on electronic items is much more higher than normal goods as it need different handling and packaging. After you have confirmed the type of courier service, you may proceed with the payment by clicking on the big orange button below. Then you may pick on the payment method to make payment, either using credit card or e-banking (extra charges of 1.5%). I recommended to use credit card which is a lot safer. 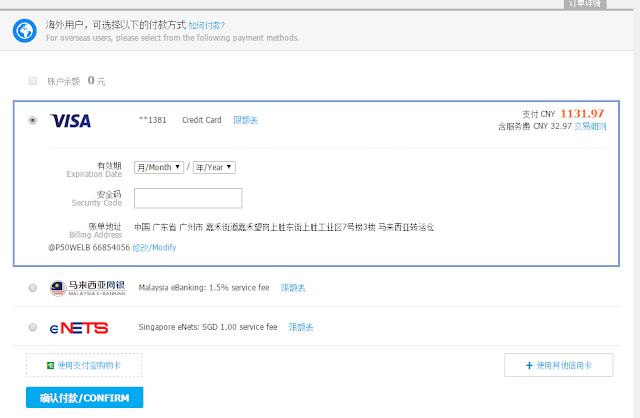 After payment, go to 我的淘宝>已买到的宝贝 to check on the status. The seller will need to pack and send the item to warehouse within 24 hours. If the status doesn't change, you can click on the reminder button to prompt the buyer. Once the item arrive to the warehouse, click on the make payment to warehouse on the highlighted column (since I completed the shipping payment, it is no longer showing). The warehouse will show the weight of the good and the shipping price, you will need to make payment on the shipping cost to the warehouse. Remember, you don't pay shipping cost to the seller directly if you are using Global Consolidate and Shipping. Tip 4: Log in to the website daily to check the status, you will receive Taobao's email on updated status but it is quite late (this is the only downside of it). Just to avoid late payment on shipping cost, I would recommend to check daily on the website. After that, wait for your good to arrive at your door step! It took around 7 working days from the day I ordered till arrival of the item. Here is the HUROM slow juicer I received today, have a sneak peak on it. The package I received is in very good condition. It was packed into three boxes. The Hurom slow juicer is exactly the same as the photos shown by the seller. The downside about buying electronic items through Taobao is the plug is China three pin design which is different from Malaysia. You need to prepare a travel adapter to use it. Check out my Hurom Juicer review here. 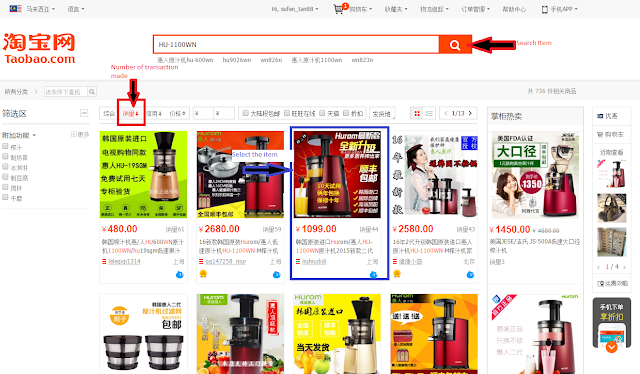 I hope you find this post useful when come to buying from Taobao. If you need more information about it, leave me a message below.